Kicking off the first week of May, we’re back again for day 4 of our 20 day giveaway celebration of AnandTech’s 20th anniversary. Last week we gave out a lot of processors, so it’s only fitting that today something to use those processors then. Thankfully MSI has just what we need, as the PC technology has sent over a pair of their latest gaming motherboards. Need something for an Intel Core processor? Or an AMD Ryzen? The good news is that no matter what, today MSI will have you covered. 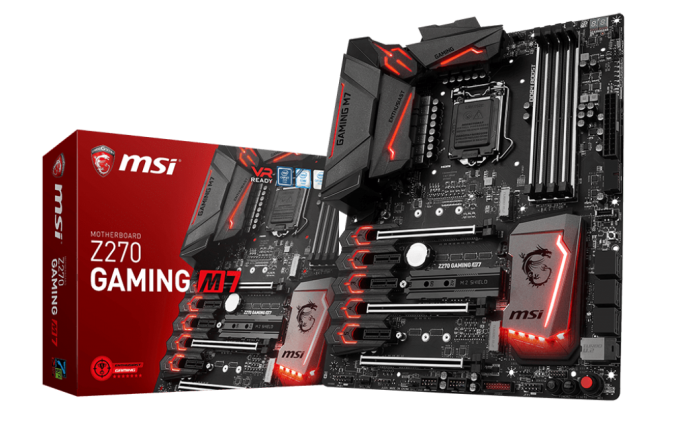 First off we have one of MSI’s high-end Z270 chipset boards for Intel’s Core processors, the MSI Z270 GAMING M7. 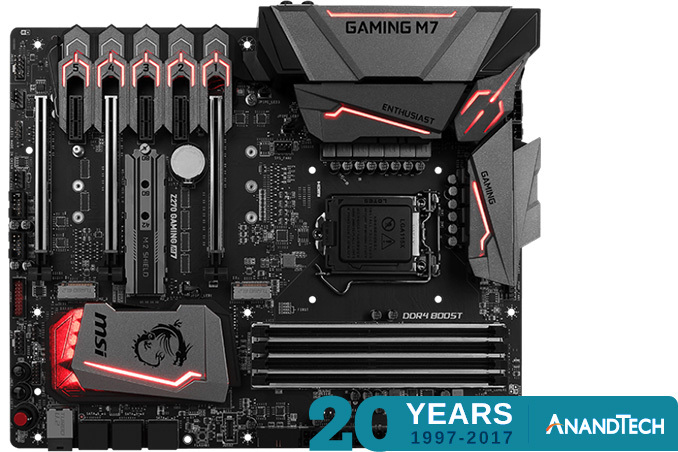 The GAMING M7 is a full ATX board, giving it room for 3 PCIe x16 slots, and another 3 PCIe x1 slots. Along with the traditional form factor, the board also sports a trio of M.2 slots, and even a U.2 port for external SSDs. MSI has also added several third-party controllers to the board, including an ASMedia ASM2142 for USB 3.1 (Gen 2) support, a Killer E2500 controller for GigE networking, and a Realtek ALC 1220 for audio. And as this is a high-end board, MSI hasn’t skimped on the features either. Along with their usual high-end BIOS features – including BIOS Flashback+ – MSI has also thrown in RGB lighting via their Mystic Light RGB system. 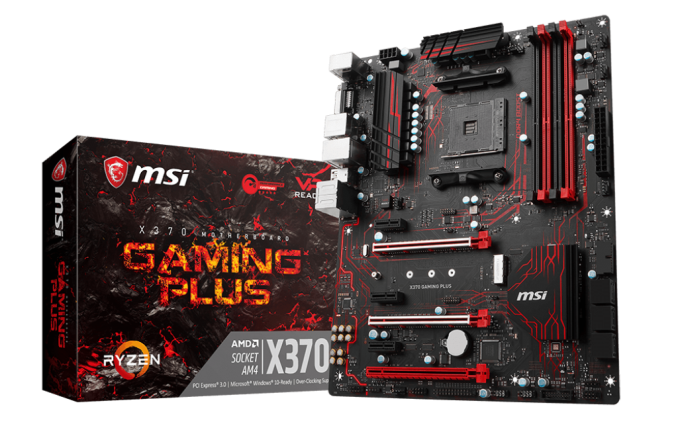 Meanwhile on the AMD side of the aisle, we have the MSI X370 GAMING PLUS. Based on AMD’s X370 chipset for Ryzen, this is also a full ATX board, sporting 3 PCIe x16 slots (2x 3.0, and 1x 2.0), 3 PCIe x1 slots, and a single M.2 slot. In terms of third party controllers, we’re looking at an ASMedia ASM2142 for USB 3.1 (Gen 2) support, a Realtek ALC 892 for audio, and a Realtek 8111H GigE LAN controller. Unlike its Intel counterpart, this board doesn’t feature RGB lighting, though it still features MSI’s Mystic Light Sync controller for controlling other RGB solutions. And it come with MSI’s usual high-end BIOS features.